U-report is a free SMS social monitoring tool for community participation, designed to address issues that the population cares about. However, in 2014, it stormed Nigeria in full force to the extent that the Federal Government made it mandatory that all 2014 Corps members (Youth Corpers) should join the platform as well as inviting other people to join. I was among those that served in the Northern part of Nigeria then and it was actually imposed by NYSC officials. At a time, corps members were required to submit the names, phone numbers and address of people they enrolled on the U-report platform as a criteria for monthly clearance before one can be paid "alawee"
Little did we know that the exercise would turn around to be a turn in our flesh as since then, our phone numbers has been spammed constantly with SMS messages from U-report Nigeria. Kingsley (my friend) decided to do away with the SIM card he used to register for Youreport because he was feeling greatly uncomfortable with it. The most annoying part of it was we were shown the easy route to join U-report but weren't shown the way out. So I have been searching for a way out and enduring till now that i finally found the way to stop the messages from popping in. Meanwhile, to show that Youreport still needs you on their platform, the process of opting out is a bit tricky so that if you make a little mistake in your answers, you will continue being a U-reporter. ✔ You will receive message that says "We regret to see you leave, is there any way we can change your mind? a)yes b)no"
✔ Another message will come in form of questions like this "Any suggestions for getting you back into our program?" "Your voice matters therefore your opinion is important to us. Please describe in one sentence your reason for leaving." ✔ Then they will request that you confirm you want to leave "Please confirm that you still would like to leave ureport Nigeria and not receive any messages anymore? 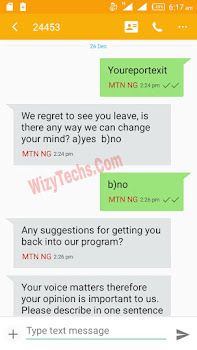 a)yes b)no"
✔ Then, you will receive this final message "We are sad to see you leave. Thank you for all your valuable contribution. You have now been removed from Ureport. 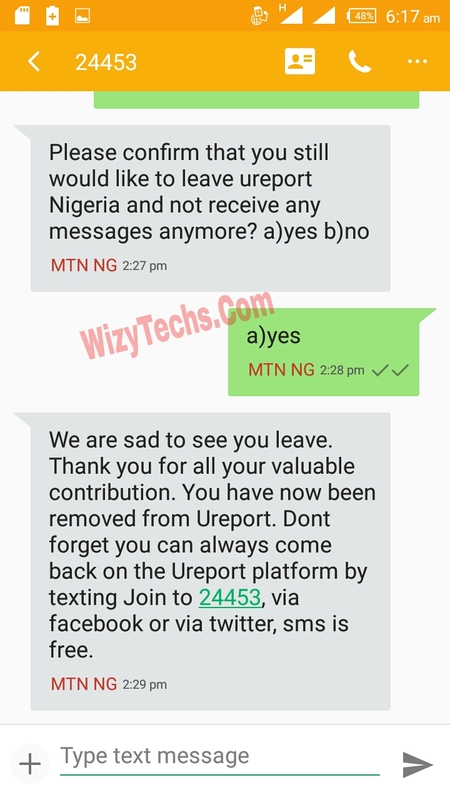 Dont forget you can always come back on the Ureport platform by texting Join to 24453, via facebook or via twitter, sms is free." 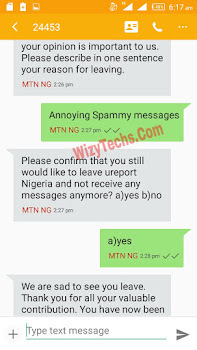 Below are the screenshots of how to stop U-report messages beeping on your phone. You are now free from the day-to-day sms notifications from U-REPORT and you can now have rest of mind at last. 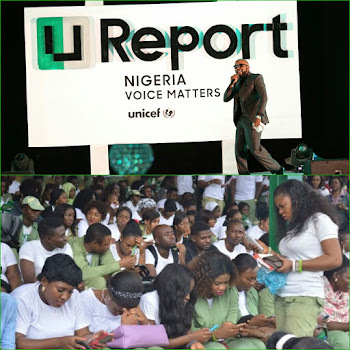 Am not sure if current Youth Corpers where subjected to join Youreport. Are you a serving corps member? Let us know. My oga dis my number 09037598574, I can't stay a day without visiting ur blog, but I'm sorry for not always commenting, Pls my own round of mtn card. this doesnt seem to work for me. it shows 'network out of order'. Lol!And Gold is is Sold to get the Old before it Fold. Thank God, am out of U-report crazy messages.